Wed, Mar 20, 2019, 09:34 pm SL Time, ColomboPage News Desk, Sri Lanka. 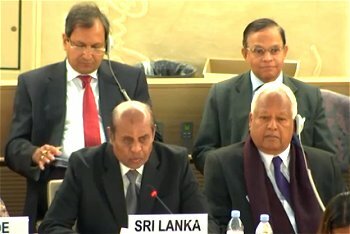 Mar 20, Geneva: Sri Lanka, committed to pursue the process of Truth, Justice, Reparations and Guarantees of Non-Recurrence in 2015, has been taking concrete action since, to move forward on these pillars, the Sri Lankan delegation told the 40th regular session of the United Nations Human Rights Council in Geneva today. Responding to the report of the High Commissioner of Human Rights on Sri Lanka at Wednesday's session, the leader of the Sri Lanka delegation, Foreign Affairs Minister Tilak Marapana highlighted the substantial progress Sri Lanka has made in implementing the commitments of the 2015 UN resolution 30/1 since its last review in 2017. Appreciating the acknowledgement throughout High Commoner's report of the open, constructive and cooperative approach adopted by the Government of Sri Lanka, towards all stakeholders, both within and outside the country, and with the processes and mechanisms of this Council, Marapana said Sri Lanka's intention has been to engage comprehensively so that "our deep-rooted commitment to achieving reconciliation is made evident." Pointing out that the action by the Sri Lankan security forces during the conflict was against a group designated as a terrorist organization by many countries, and not against any community, the Minister said all communities in Sri Lanka were united against terrorism, and now that terrorism has been defeated, all communities are working in unison towards reconciliation and economic progress. Responding to the High Commissioner's claim that Sri Lanka's ordinary criminal justice system is unable to deal with the nature of the allegations of human right violations, the Sri Lankan Minister said the judicial system in Sri Lanka is adequately equipped to deal with complex crimes while the complex criminal investigations are time consuming. Raising the issue of the death toll during the last stages of the conflict, Minister Marapana pointed out that there has been persistent and repeated reference in official documents of the OHCHR and the UNHRC to exaggerated numbers as the alleged death toll and these assertions remain in direct contradiction to independent assessments sent by foreign missions, UN agencies as well as other international organizations, including the ICRC, and some heavily redacted accounts of which have been presented in the House of Lords in the UK on 12 October 2017. "The Government of Sri Lanka believes that it is indeed erroneous that more attention has not been paid to the above mentioned information, by agencies including the OHCHR, which is required to seek the truth," he said. Commenting on the prejudicial statements made in the OHCHR report on the discovery of human skeletal remains in a mass grave in Mannar, which have been scientifically dated back to 1499-1719 AD colonial era, Mr. Marapana said the case points to the need to exercise caution in approaching issues of this nature. "This is yet another instance that demonstrates that allegations and mere collection of data should not be pre-judged to cast unjustified aspersions. It also amply demonstrates the need for allegations to always be subject to the due process of investigation in accordance with established legal procedures and not be hastily credited to support unfounded assumptions," he said. With regard to the release of land in the North and East, Minister Marapana said 88.87% of State land and 92.16% of the private land originally held by the Security Forces, since May 2009 have been released and the figures highlight the utmost priority accorded by the Government to the incremental and expeditious release of lands held by the security forces. However, he asserted that, the remaining lands, which are a necessity in the context of national security, would continue to be held by the security forces, with compensation being paid in respect of privately owned lands. In conclusion, Mr. Marapana said the Sri Lankan Government looks forward to continuing its engagement with the Office of the UN High Commissioner for Human Rights, UN Human Rights mechanisms and procedures, and working in close cooperation with the international community in its journey towards achieving civil, political as well as socio-economic and cultural rights, and consolidating durable peace and reconciliation for our people.